If you will be in Michigan, you should definitely visit Nub’s Nob Ski Resort. Nub’s Nob has what is considered to be the Midwest’s best snow, and the resort has a reputation for being a family friendly mountain. Generations of families have brought their children here for their very first ski run. The mountain layout is fairly simple with an elevation of 1338 feet and a vertical drop of 427 feet. There are 43 trails serviced by eight chair lifts. Boasting one of the best skiing and snowboarding schools in the country, both private and group lessons are available. 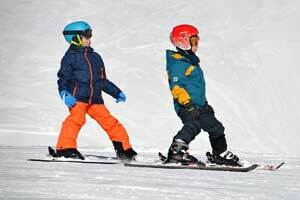 If you are brand new to the sport, you can even learn to ski free, and take advantage of Nub’s Cubs Childcare Center while you learn. Don’t make the mistake of thinking that intermediate or expert skiers won’t find any challenges waiting for them at Nub’s Nob! The terrain is varied, and you will find challenges. Night Skiing is also available. The Ski School offers training programs for advanced skiers who are interested in racing, and many racing events are held at the resort. You can signup for race leagues at the resort, and many league events are planned each season. Equipment rental is available, and there is a General Store right inside the lodge, where you can purchase gloves, hats, and neck warmers among a variety of other items. You should also visit the technology center to have your ski’s tuned or repaired. nub’s method from Kevin Temple on Vimeo. You won’t go hungry either! Nub’s Nob Cafeteria is open for breakfast and lunch, and if you brought your own lunch, you can eat in the ‘brown bag’ room. Nub’s Winter Garden serves grilled burgers when the weather allows. Pintail Peak Warming Hut is located at the top of the Black Lift. Here, you can enjoy amazing views while enjoying home made soups and sandwiches. Nub’s Nob is the place to go if you want to have a great family ski vacation – or if you are already an expert skier interested in racing and skill events. There is plenty to do and see. In fact, you may find that you have a problem deciding which activity to participate in first! Don’t worry about missing anything, though – if you want to ski now and board later, you can do that. Most events are planned for the weekends, so arrange your schedule so that you are able to attend or participate in the planned events.